Stop at The Sun Siyam Iru Fushi Luxury Resort to discover the wonders of Maldives Islands. The hotel offers a high standard of service and amenities to suit the individual needs of all travelers. Facilities like 24-hour room service, free Wi-Fi in all rooms, 24-hour security, daily housekeeping, gift/souvenir shop are readily available for you to enjoy. All rooms are designed and decorated to make guests feel right at home, and some rooms come with television LCD/plasma screen, additional bathroom, additional toilet, air purifier, bathroom phone. Entertain the hotel's recreational facilities, including badminton court, boats, canoe, dart board, hiking trails. 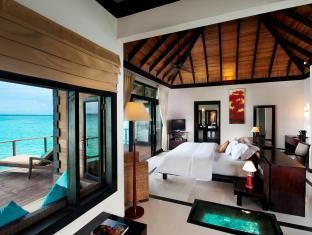 Discover all Maldives Islands has to offer by making The Sun Siyam Iru Fushi Luxury Resort your base.